Deciduous forests can be found in the eastern half of North America, and the middle of Europe. There are many deciduous forests in Asia. Some of the major areas that they are in are southwest Russia, Japan, and eastern China. South America has two big areas of deciduous forests in southern Chile and Middle East coast of Paraguay. There are deciduous forests located in New Zealand, and southeastern Australia also. The average annual temperature in a deciduous forest is 50° F. The average rainfall is 30 to 60 inches a year. In deciduous forests there are five different zones. The first zone is the Tree Stratum zone. The Tree Stratum zone contains such trees as oak, beech, maple, chestnut hickory, elm, basswood, linden, walnut, and sweet gum trees. This zone has height ranges between 60 feet and 100 feet. The small tree and sapling zone is the second zone. This zone has young, and short trees. The third zone is called the shrub zone. Some of the shrubs in this zone are rhododendrons, azaleas, mountain laurel, and huckleberries. The Herb zone is the fourth zone. It contains short plants such as herbal plants. The final zone is the Ground zone. It contains lichen, club mosses, and true mosses. The deciduous forest has four distinct seasons, spring, summer, autumn, and winter. In the autumn the leaves change color. During the winter months the trees lose their leaves. The animals adapt to the climate by hibernating in the winter and living off the land in the other three seasons. The animals have adapted to the land by trying the plants in the forest to see if they are good to eat for a good supply of food. Also the trees provide shelter for them. Animal use the trees for food and a water sources. Most of the animals are camouflaged to look like the ground. The plants have adapted to the forests by leaning toward the sun. Soaking up the nutrients in the ground is also a way of adaptation. A lot of deciduous forests have lost land to farms and towns. Although people are trying to protect the forests some poachers are trying to kill the animals in the forests. The animals are losing their homes because of people building their homes. The word "Deciduous" means "falling off or out at a certain season". That explains why deciduous forest means a forest in which the leaves fall off the trees when the winter comes. The deciduous forests are located in the temperate zone above the tropical forests and below the coniferous forests. Most of Europe, the eastern half of North America, parts of Japan and Asia were once covered with large deciduous forests. Most of the deciduous forests have now disappeared but many of the trees still grow in deciduous forest biome. The types of trees you can find in these three regions are broad leafed deciduous trees and some of the evergreen species. The trees are more commonly known as ash, oak, lime, beech, birch and northern arrowwood. Also found in this biome are wild flowers such as oxlip, bluebells, painted trillium and primrose. As well as things such as carpet moss, tawny milk-cap mushrooms and lady fern. The soil is very fertile. In fact, some of the great agricultural regions are found in this biome. That is one of the reasons there aren't a lot of original deciduous forests left in the world. Almost all of the forests in North America are second growth forests but it still has the biggest variety of original plant species. In Europe there are only a few species of original trees left. Most of the forests have been cleared for agriculture. China has been clearing the natural trees for at least 4,000 years and most of the forests are man-made. There are many types of animals in the deciduous forest ranging from mammals like deer to bugs like mosquitoes. Many of the animals are either nut and acorn feeders, or omnivores. Many of the animals have adapted to forest life. Some of them hibernate during the winter months. A few common animals found in the deciduous forest are, deer, gray squirrels, mice raccoons, salamanders, snakes, robins, frogs and many types of insects. Some animals migrate south when winter comes. Most deciduous forests are found in Eastern North America somewhere around 35-48° N, and Europe and Asia around 45-60° N. There are some deciduous regions in the southern hemisphere but their plants and animals are different from those of the northern deciduous forests. The average temperature is around 50° F (about 10° C). The average rainfall is 30-60 inches (75-150 cm ) per year. You can find all four seasons: winter (cold and frosty), summer (hot and humid), fall (cool and breezy), and spring (warm and breezy). There is about a 6 month growing season. "Deciduous Forest". World Book Encyclopedia. 1994 ed. "Deciduous", Websters New World Dectionary, 1994 ed. "Temperate Deciduous Forest", http://www.coff.edu/ete/modules/msese/earthsysflr/clymo5.html (June 4, 2000). 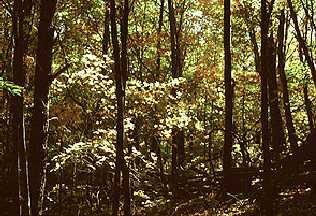 "Mid-Latitude Deciduous Forest", http://wbgnet.mobot/sets/temp/index.htm (June 4, 2000).